If the Jeff Daniels' dialogue in this video actually represented a real speech before a real university body and not a script that liberals pored over for hours to make it sound spontaneously patriotic, it would have been a dynamite speech. Minus, of course, the crude, profane language that was not needed and would not have been spoken in real life. But the scene has all the earmarks of Emmy-winning speech next year. Lefties thrive on taking God's name in vain. 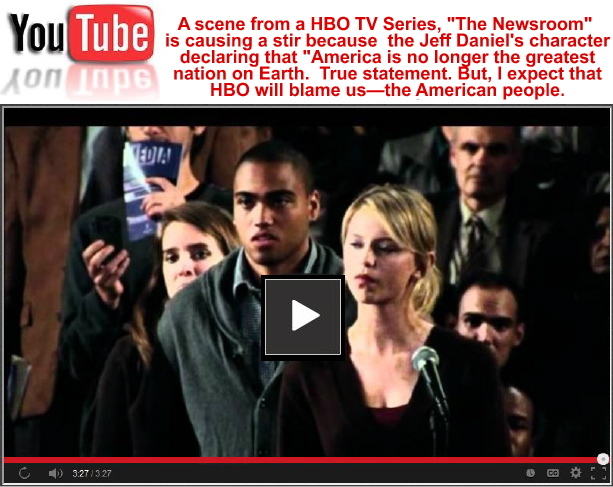 The clip is from the 2012 HBO TV series called "The Newsroom." Jeff Daniel's played the role of Will McVoy, a TV anchorman. Of course that means Daniels—oops, McVoy—is, I guess (because I never watched the show)—a center-left Democrat out to save the world from the likes of the Tea Party conservatives whom the left insists loves fossil fuels, hates homosexuals, lesbians and illegal aliens who only want a better life by taking your job—if you still have one. And most of all, the "patriotic" Watermelons (the social progressives your friends and neighbors voted for—environmentally green on the outside, communist red on the inside) who are determined to rid the Earth of all that nasty carbon dioxide in order to make the air better to breathe. Or rather that is, what air that will be left to breathe after ridding the world of all of greenhouse gases. (If you don't remember the movie Solyent Green  or the more recent, one season-only sci fi thriller, Terra Nova , you need to go online and buy them. Every now and then Tinseltown gives you an accurate glimpse of the future which awaits us. They just change who's to blame for destroying our world. Both movies give a very accurate, realistic glimpse of what's going to happen to our world when the Watermelons succeed in reducing carbon dioxide gases down to measurements by the teaspoon. When oxygen levels within our atmosphere drop enough, the world will begin to experience horrific droughts and very real global starvation, catastrophic dehydration from lack of water, followed by a very painful death. And, if you somehow survive that, you will still experience asphyxiation, turning blue as you gasp for what little toxic oxygen remains in an atmosphere of inert gases you cannot breathe. What the Watermelons know—and what you should remember from elementary school biology—when you get rid of all the carbon dioxide, you will no longer be able to breathe because there won't be enough oxygen left in the atmosphere to keep you alive. An atmosphere deprived of oxygen is a dead atmosphere. To continue breathing, we need an atmosphere that is at least 20.95% oxygen. Whatever portion of the 78.09% nitrogen we breathe in, we exhale. Nitrogen is an inert gas. If you eliminate the oxygen, you will die from inert gas asphyxiation. Make no mistake, it's the oxygen that keeps us alive. Eliminate the carbon dioxide and you eliminate the oxygen. Cyanobacteria in the chlorophyll in green plants absorbs carbon dioxide, and with the aid of sunlight through photosynthesis, green plants produce oxygen which, mixed with nitrogen and several other organic elements, produce the air we breathe. Oxygen and hydrogen produce the water we drink. Eliminate carbon dioxide, or greatly curtail it, and we erase a large portion of both the air we breathe and the water we drink. Eradicate all of it like the Watermelons want to do, and we die—all of us. And, in their dying breathe, the Watermelons will expire blaming the rest of us for mankind's fate. This is the gift the social progressives have for the former greatest nation on Earth. And what do the social progressives hope to get in return for their good deed of outlawing carbon dioxide? Eliminate about 75% of the world's population, and pocket billions of dollars in Cap & Trade commissions as the former greatest nation on Earth (which has lost over half of its industrial might) will buy carbon credits from the emerging nations who now possess most of America's industrial jobs. Keep in mind, the social progressives know buying and selling carbon credits isn't going to change the amount of carbon emissions anywhere on Earth. It's sole purpose, other than to enrich social progressive politico and politically-connected campaign donors, is to prevent the small-up-and-coming businesses that have the acumen to compete with the Fortune 500 giants on a level playing field but can't afford to buy enough carbon credits to keep their coal or natural gas-fired factories competing with the princes of industry in the former greatest nation on Earth. When I watched this trailer, I actually wished it was real. The character, Will McVoy, addressing a university student body over the question "What makes the United States the greatest nation in the world?" Minus the profanity, I wholeheartedly agreed with the Jeff Daniels' character respond that America is no longer the greatest country in the world. What the trailer failed to answer was the most important question. WHY? Clearly, HBO is a member of the social progressive Tinseltown Club. So, whether or not the Daniels' McVoy character is initially depicted as a flag-waving good guy, without ever seeing anything more than the trailer, I'd still bet even money that McVoy is converted to the dark side in the Watermelon world where too many people, not the lack of people, in the industrialized world are blamed for the world's economic and social woes. The McVoy character points out that in two world wars, the United States of America fought two enemies in different parts of the world simultaneously. In addition to providing all of their war needs to defeat those enemies, they also supplied all of their allies in both Europe and Asia with the food, weapons, munitions, machines of war—and the gasoline to fuel them. What America accomplished frightened Josef Stalin who was one of the recipients of that largess of the greatest nation in the world. From 1915 to 1945 the United States was more powerful than all of its allies combinedincluding the Soviet Union and the Republic of China. No other nation in the world realized, until World War II, just how strong England's "former colonies" had become, nestled away as an island fortress at the crossroads of the world. How did America become so strong? You could say it was the frontier spirit of the American patriot. But, the truth is, it was because of the entrepreneurial spirit of America. In the American free enterprise system, unencumbered by government interference in the first half of the 20th century, free enterprise built the most powerful industrial complex the world has ever seen. It was this industrial ingenuity that allowed America to switch from peacetime to wartime manufacturing virtually overnight, holding its enemies in the Pacific at bay with one hand while they built the war machine they needed to defeat those enemies with the other. What America did in 1917 and again in 1941 it will not be able to do in 2017, and unless the American people take back their country very quickly and put on trial and imprison every social progressive in this nation's government—federal judges included—who have violated the Constitution, it will be impossible for the late, great United States to even win a two-front minor skirmish with jackleg Muslim renegades armed only with improvised explosive devises and Soviet-made hand-held rocket launchers. Why? Because we no longer possess the industrial might we had in the era of Free Enterprise America. We are no longer the greatest nation in the world because most of America's major factories are closed down and boarded up. The products which were made in those factories—from consumer goods to automobiles to Stealth fighter and bombers down to the uniforms America's fighting forces wear—are now made (among other places) in factories in China, Indonesia, Pakistan, and other third world nations. Do you see a problem here? Not only do we no longer possess the industrial wherewithal to convert peacetime manufacturing to wartime manufacturing, we surrendered our industrial might to our deadliest enemiesthe Muslim world, the People's Republic of China and the re-emerging Soviet Union which tricked America's corrupt politicians who are still being spoon-fed millions of dollars in bribes (i.e., campaign contributions) to write the laws the princes of industry need to erase America's national sovereignty and make America a puppet state in a global union, and to make the US Supreme Court subservient to the World Court in the Hague. The Daniels' character, Will McVoy, was right. So were the puppeteers from Tinseltown who scripted his words: "No, America is not the greatest country anymore!" If America was attacked by one or more of our enemies tomorrow morning, what factories do we still have in the United States that we could quickly convert to war production as we did in 1917 and again in 1941? Pretty much none. What steel mills would supply us with the steel we need for the hulls of aircraft carriers, nuclear submarines and battleships? What steel and aluminum mills would supply us with the sheet metal we would need for jet fighters and bombers? And tanks and personnel carriers? The EPA has pretty much put the steel industry out of business. We have been disarmed from within. Of course, we could call on our Chinese, Indonesian or Muslim factory owner-friends in Asia and the Middle East to pull the Chryslers, Chevrolets and GMC trucks from their assembly lines and gear up the production of war materials so America could meet the new threat to liberty. But, we've already met that threat. That's who the princes of industry and the barons of banking are in bed with. Those enemies now own the factories that once made America great. Whose weapons do you think they will be making when that day arrives?